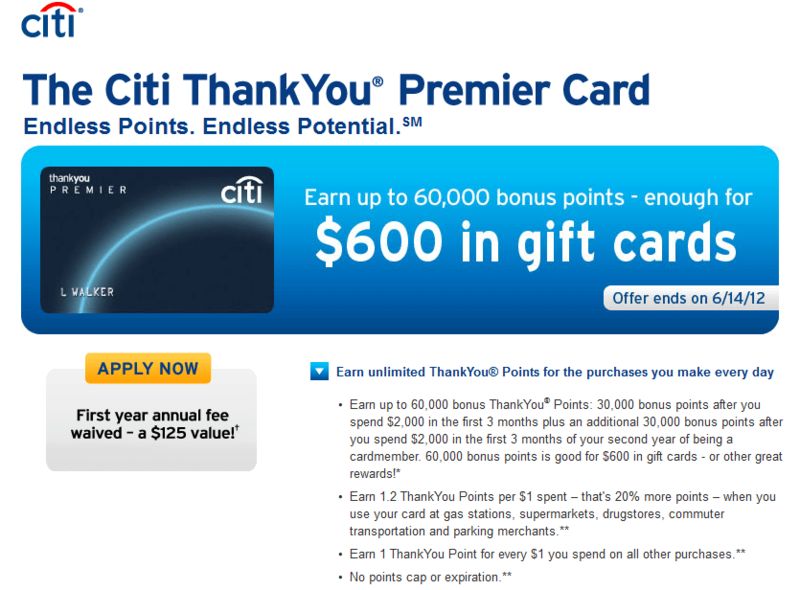 60,000 POINT CitiBank Thank You Premier card! I found a (deal is now DEAD) Best deal is the 50, 000 point link (50k deal dead now too) now (also NOT my link btw) working 60,000 Point CitiBank Thank You card link (note this is NOT my link)! It is clearly better than the 25,000 one I can offer. This one seems only to be valid until June 14th but these kinds of offers can disappear quickly as we all know. You do have to spend $4000 to get all the points but if you are thinking about a round, this would be a good one to look at. 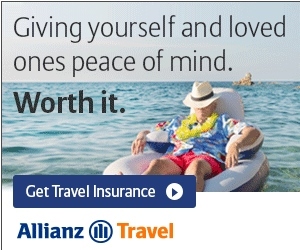 You only get the additional 30000 points when you spend $2000 in the SECOND year which means you will have to pay the annual fee for the second year losing the benefit of the extra points. I think this is worth less than the 50000 point offer for spending money in the first year with the annual fee waived for the first year. Thanks, note its 60k in two years, still good, jumped at this offer. Great find. One note about the reward points: that’s 60k points spread over two years. Earn up to 60,000 bonus points: You will receive 30,000 bonus ThankYou Points after $2,000 in purchases are made with your Citi ThankYou Premier Card within 3 months of account opening. You will receive an additional 30,000 bonus points after another $2,000 in purchases are made within the first 3 months of your second year of cardmembership. You do not need to qualify for the first 30,000 points to be eligible to earn the second 30,000 points. Read the terms carefully: 30K points now after spend, the other 30K after spend IN SECOND YEAR, meaning you will have to pay the $125 annual fee (waived in year one) first. are these City ThankYou points being taxed, like City AADvange miles? does anyone know?